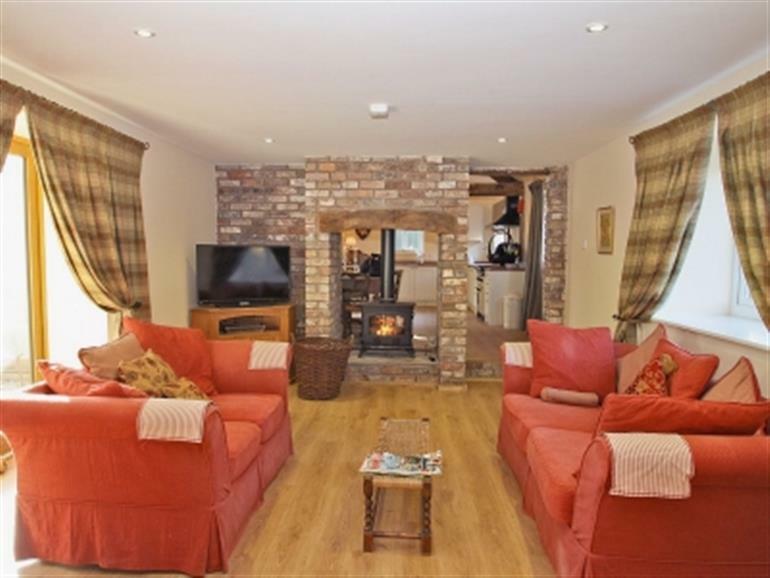 Clawdd Offa in Penyffordd, near Chester sleeps 9 people. 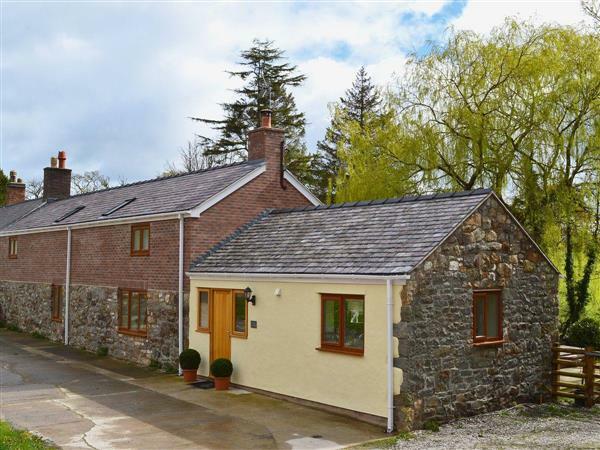 Set within 6 acres of natural countryside, Clawdd Offa offers spacious and comfortable family friendly accommodation in the heart of North Wales. This fantastic barn conversion successfully manages to combine all of its original rustic charm with its exposed brickwork, beams and cosy wood burner alongside all the comforts one requires from a holiday home, including a well equipped kitchen, contemporary bathrooms, fibre optic Wi-Fi, Smart TV and private outdoor hot tub. Located near to the Flintshire village of Penyfford, which is just 10 miles from the historic city of Chester, Clawdd Offa is the ideal base from which to explore all that Cheshire and North Wales has to offer. Situated on the Wats Dyke footpath, with walking directly from the doorstep, the barn is perfect for those who love the outdoors. Other activities available locally include cycling, fishing and golf. Ideal for families, there is so much to see and do in the area. Children will enjoy Chester Zoo, Blue Planet Aquarium and Go Ape at Delamere Forest, which are all within a 30-minute drive, and the popular beach resorts of Prestatyn, Rhyl and Talacre are within a 40 minute drive. The city of Liverpool with all its many sights and attractions is also only 40 minutes away. Snowdonia can be reached in an hour, and just over an hour’s drive will take you over to Anglesey. For those who prefer to leave the car behind, there is a railway station in Penyffordd with trains into Wrexham, Liverpool and Chester. The shop, pub and restaurant are all ½ mile from Clawdd Offa. Ground floor: Living room/kitchen with breakfast area, French door, beams and wooden floors. 1 double (5ft) bedroom with en suite shower room and toilet. Separate toilet. First floor: 3 bedrooms: 2 double, (one 5ft), one with single bunk over, 1 twin. Bathroom with claw foot bath, shower cubicle and toilet. Wood burners in living room/kitchen (initial fuel included). Solar central heating (underfloor on ground floor), gas, electricity, bed linen and towels included. Five Freeview TVs (two Smart TVs). DVD. Gas range included. Microwave. Washer/dryer. Dishwasher. Fridge/freezer. Wi-Fi. Enclosed, lawned garden with patio and sitting-out area. Barbecue. 6-acre natural ground. Ample parking. Hot tub. Pet free of charge. No smoking. Holidays at Clawdd Offa in Penyffordd run from Friday to Friday. NB: Stream in garden, 15 yards. Lake in grounds, 200 yards. Pets allowed at Clawdd Offa. For a better idea of where Clawdd Offa is, you can see Clawdd Offa on the map below. You can find more large holiday cottages (that's cottages which sleep 8 or more people) in Cheshire. If you want to see more large cottages, have a look at large cottages in Cheshire. Clawdd Offa is in Cheshire; should you be on the lookout for a special offer, you can find all the special offers in Cheshire. It's always worth checking to see what is on offer at the moment. Do you want to holiday near Clawdd Offa (30728), you can see other cottages within 25 miles of Clawdd Offa; have a look to find your perfect holiday location.